Is your business operating at its best? What if you could learn strategies from more than 40 years of business success in just five days? 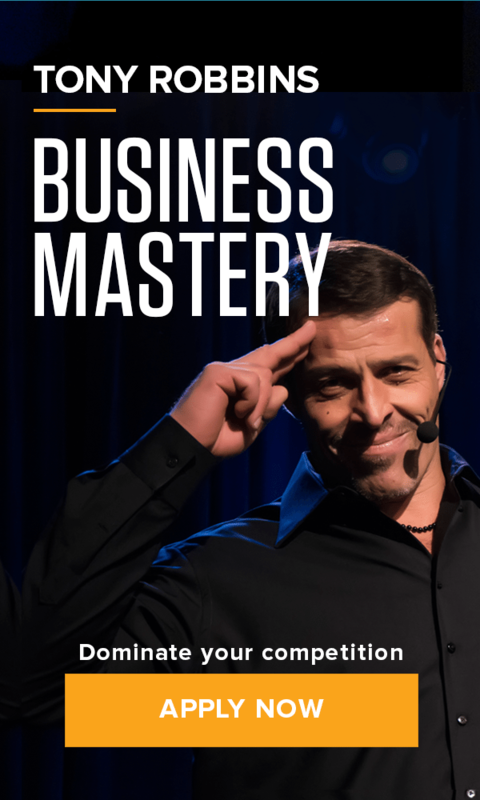 At Business Mastery, Tony Robbins and some of the greatest business minds come together to share their proven strategies for success. You’ll hear what worked for them, what didn’t, what they learned from their failures and what they see as the key to remaining the leader in your industry. Past speakers include John Paul DeJoria (Co-Founder, Paul Mitchell and The Patron Spirits Company), Joe Gebbia (Co-Founder, AirBnB), Melanie Whelan (CEO, SoulCycle) and Neil Blumenthal (Co-Founder and CEO, Warby Parker). After working with top business leaders and CEO’s for Fortune 500 companies, Tony Robbins has mastered the psychologies and strategies necessary for a business to thrive in any economic environment – and he’s sharing everything he’s learned with you. Designed to empower you with cutting-edge systems, skills and strategies to create an invincible advantage over your competition, you will leave Business Mastery after five days with knowledge not taught in anywhere else – not even in business school. One of the most challenging parts of running a business is the inevitable failures you will have along the way. Business Mastery gives you the unique opportunity to learn to anticipate and recognize potential problems before they arise, avoid common mistakes and constantly innovate to stay ahead. Take a look at your business and ask yourself where it is right now. Where do you want it to be? How are you going to get it there? You’ll answer these questions and more at Business Mastery as you design a vision with actionable strategies to take your business to the next level.